TOKYO: Mapletree Investments, a real estate firm wholly-owned by Singapore state investor Temasek Holdings, plans to launch a Japan property fund of around 80 billion yen (US$928mil) this year in a bid to expand in the country’s property sector ahead of its rivals. The new fund, with 30 billion yen of equity, will invest in business-related properties such as data centres, research and development facilities, and office buildings just outside central Tokyo and other big cities, Terence Heng, general manager of Mapletree Investments Japan, told Reuters in an interview. “We need to get ideal properties now. It’s likely to become difficult to see those attractive deals if we miss the chance now ... The opportunity window is open for a year or two, or even shorter period than that,” he said. Mapletree, which opened its Japan office in 2007, has been ramping up its investment in Japanese logistics facilities mainly for its Mapletree Logistic Trust, which owns warehouses and other industrial properties across Asia. In Japan, the Singaporean company manages 12 properties, mostly logistics assets, worth 60 billion yen. But it aims to more than triple this to 200 billion yen in the next two to three years before competition heats up in the market, Heng said. ”We should proactively buy properties if they are good,” he said. Permodalan National is looking at acquiring B grade (commercial buildings) with potential and sell them to PNB's real estate investment trust, Amanah Harta Tanah PNB. Permodalan National Bhd's (PNB) asset management unit is in talks to buy commercial buildings in the heart of Kuala Lumpur as it seeks to provide assets for its property trust. PNB Commercial Sdn Bhd, which has RM1 billion of assets, plans to buy properties in the Golden Triangle area, improve their performance and sell them to PNB's real estate investment trust (REIT), Amanah Harta Tanah PNB. "We have identified a few buildings within the Golden Triangle. 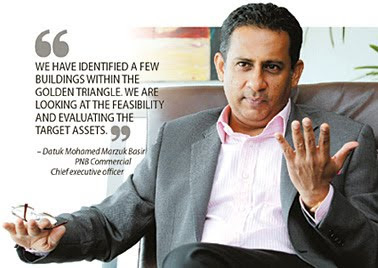 We are looking at the feasibility and evaluating the target assets," PNB Commercial chief executive officer Datuk Mohamed Marzuk Basir said. However, there is no set allocation or fund for these acquisitions. When the study is completed, it will be presented to the board to decide on the acquisitions. "We are looking at B grade (commercial building) with potential," Mohamed told Business Times in an interview. "We will take an underperforming asset and then nurture it to a respectable yield level within three to five years," he said. These buildings typically have about 100,000 sq ft to 150,000 sq ft nett lettable area. PNB Commercial currently manages 19 assets. Out of this, 11 are owned and managed by PNB Commercial, while the remaining eight are managed for PNB. Apart from office buildings, assets under its management include retail and hospitality properties. For the time being, it is not looking at expanding its retail or hospitality portfolio but only enhancing its existing assets.